CV templates to download, impress the recruiter, get interviews, get hired. When you download the latest models and styles of resume templates for Microsoft Word (Office), you’re set within minutes. If you are a job seeker, applying for a job can be a stressful process. 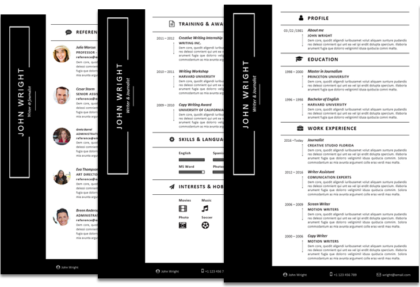 Downloading a resume template for Word can save you time, put you in the right direction with a pre-designed layout to work on, and give you that professional “look and feel” that will ease receiving calls back for a job interview. Our Word resume templates for Microsoft Office are easy to edit and very user-friendly. Every single element can be edited, colors can be changed as per your preference (several color variations are included), you can add or remove a candidate photo, and perform any actions as you would do with a normal MS Office Word file. Just select the Microsoft Word resume template of your choice and you’re all set, you can download it instantly after purchase. Once you have added your details and work experience, you can also save your resume as PDF if you wish. Do you need a professional resume template? Absolutely, using a professional resume template is becoming a must these days. Modern times can be challenging when applying for a job, competition is huge. There are several qualified applicants out there, and a good presentation is crucial in order to stand out from the crowd. Did you know that only 2% of applicants make it to the interview? 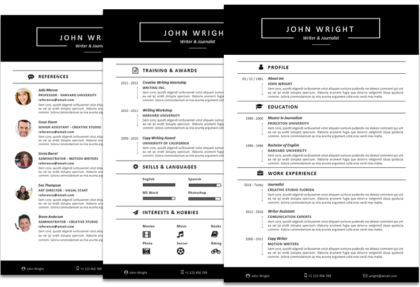 A professional resume template is the very first step to land the dream job you always wanted. Since the perspective company doesn’t know you yet, you want to impress the recruiter and present yourself in the most professional manner. So let’s start by adding some of your relevant skills and achievements to match the job description you are applying for. The professional appearance of your resume will give you that extra shine, raising your application to the top of the long list of anonymous applications. Your professional resume template will help your perspective employer to locate you, and will present you as the most professional candidate they are looking for. Should you use a modern resume template? 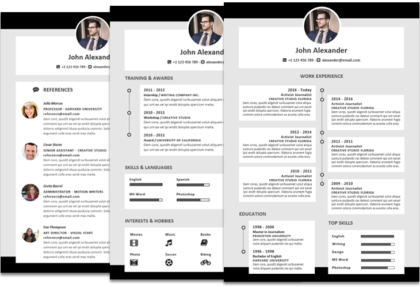 Using a modern resume template when applying for a job can be an elegant way to present yourself and catch the attention toward you as a candidate. Recent studies determined that resumes only have about 6 seconds to catch the recruiter’s interest. That’s when they will unconsciously make up their mind whether they should give a deeper look to a resume. Just imagine the scenario. 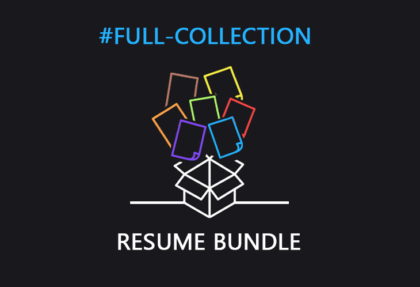 Any average recruiter receives a full stack of resumes and applications, has little time to screen each of them, struggles with short deadlines to find a candidate, all while trying to fit the work schedule and daily routine. 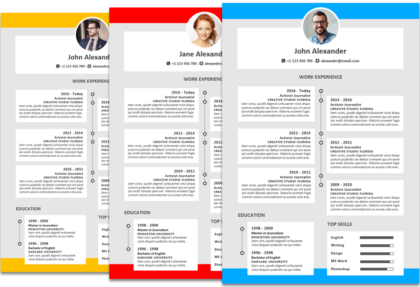 A modern resume template is the best tool if you’re looking to stand out from the competition. It conveys a better first impression, it introduces you in a professional manner, it’s well organized and pleasant to read. 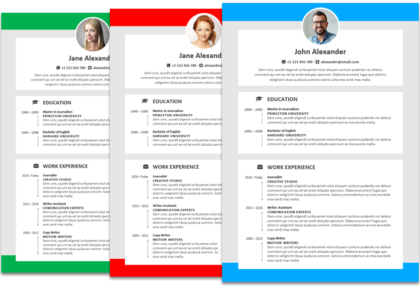 After a long day at work screening a number of resumes, the modern resume templates will be the ones that catch the attention of the recruiter at the end of the day. 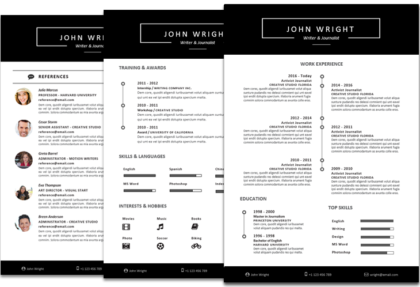 Should you use a creative resume template? It is commonly known that creative resume templates can be a very powerful tool when applying for a position that involve the use of creativity, such as marketing, advertising, media, web and so on. This is surely true, as you are showing to the recruiter your creativity and ideas, and it can be a great move that can make a lot of sense. On the other hand, just everyone can take benefit of using creative resume templates for a job application, as long as some criteria are met. There are certainly many resume designs out there, some look very creative, some get a bit too funky at times. Our creative resume templates simply convey an overall feeling of creativity, but only in terms of being modern and trendy. They will give you that professional and modern appearance, without being too extravagant. 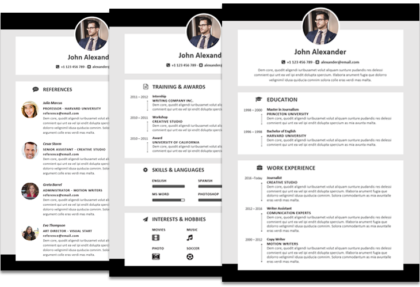 Generally speaking, a functional resume template is a template design that is easy to use, or in other words, user-friendly. It should provide properly structured layout and sections, as well as enough space for the applicant to fill in the information. Also, it should effectively displays all the career achievements and information, so that recruiters/employers will easily find everything they are looking for, at a quick glance. The design and layout are crucial; a well designed resume template will accomplish these objectives. Therefore, a functional resume template can be considered as such when it’s easy to compile for the user/applicant, but most importantly when it displays information in the best possible way for the reader/recruiter, in order to highlight the most important information about the candidate. All our functional resume templates were designed with these criteria in mind.